Extracted from the Minutes of the Club. The first sketch of the following work was drawn up with the view of its being prefixed to an edition of General Mackay’s Memoirs, then in course of preparation for the press, from a manuscript copy in the Library of the Faculty of Advocates. The Editors were three members of that learned body, viz. Patrick Fraser Tytler, Adam Urquhart, and James Hogg, Esquires, who, as members of the Bannatyne and Maitland Clubs, were about to enrich their historical collections, by presenting, according to custom, each member with a copy of that valuable work. It may be proper to state, for the information of some readers, that these clubs are composed of noblemen and gentlemen, associated for the laudable purpose of drawing from the obscurity of public and private repositories, and printing for distribution among the members, original manuscripts and works out of print, calculated to elucidate the history and antiquities of Scotland, not otherwise easily accessible. As the clubs consist of nearly two hundred members, considerable publicity is given to works put into their hands, and thus comparatively ready access is afforded to future historians. General Mackay’s Memoirs found their way into the Advocates’ Library about a century ago, but they do not appear to have attracted much notice, till about the year 1776, when the first edition of Sir John Dalrymple’s Memoirs of Great Britain and Ireland, was published. That ingenious and imaginative historian, frequently refers to them, in which his example has been followed, with more or less care and impartiality, by all subsequent writers concerning that period. It is General Mackay’s public conduct, however, with which they are chiefly concerned. Of his family and private history, they appear to have known no more than what they were able to collect from the few incidental notices, communicated either by himself or by Bishop Burnet, from whom they have copied, and transmitted to posterity, at least one material error. To supply this want of correct information, the learned Editors, understanding that I was the General’s representative in the male line, requested of me to furnish them with some particulars of his life, to be prefixed to the proposed volume. I accordingly drew up for their use, a brief sketch of the parentage, life, and character, of my distinguished relative, of which the Editors inserted an abstract in their “Preliminary Notice,” considering the whole too long for their purpose, but recommended the enlargement and publication of the sketch submitted to them, which would thus diffuse more widely a just impression of the peculiar merits of the General. To appear before the public in the character of an author, was to me an idea, which, though not altogether new, I had not till then seriously contemplated, and could not easily venture to adopt. Though not unacquainted with letters, I had never before written a line for the press ; and at the age of threescore and twelve, it seemed too late to begin. To these were to be added the still more formidable difficulties, arising out of my having spent the last forty-three years of my life excluded from the light of heaven, with “wisdom at one entrance quite shut out.” Keenly alive to the obstacles thus presented to my performing the duty of biographer of my venerated kinsman, in a manner that should prove worthy of the subject, or satisfactory to myself, I applied to two eminent literary friends in succession, to undertake the office, namely, to the late reverend and deeply lamented Dr. M‘Crie, so advantageously known to the public, by his learned, historical, and biographical researches, and to Thomas Thomson, Esq. whose acknowledged learning and taste, as well as the facilities afforded him by his official situation, as Deputy-keeper of the Records, pointed him out as peculiarly fitted for such an undertaking. Both these gentlemen admitted the strong claims of the subject, but declined engaging in it, on account of the multiplicity of their other vocations. They were pleased however, to approve of the sketch put into their hands, and advised me to proceed with it myself, kindly promising me every assistance in their power. Disappointed, on the one hand, in my endeavours to engage a more practised pen, and thus encouraged, on the other, by two such high authorities, to undertake the work myself, I re-commenced it about three years ago, but made slow progress with it, owing to the necessity I was under, of employing the eyes of other men, and to impediments proceeding from ill health, and other unavoidable causes. Having now at length brought it to a conclusion, I am forcibly reminded of the saying of a young Italian painter, who, when first introduced to the works of the great masters, felt abashed at the inferiority of his own performances, and exclaimed, in a tone of deep humility, “ed io cmche son pittore.” I in like manner, might exclaim, and I too am a biographer; but alas, at what an immeasurable distance have I followed those eminent men Who have preceded me in the same walk. It is however some consolation for me to reflect, that my ill success, (if such should be the result) will in some measure be attributable to the scantiness of my materials. For the General’s public history during the two short periods of his service in Scotland and Ireland, he has himself left ample materials in his memoirs, and official correspondence, French and English, from which a limited selection will be found in the Appendix to the following work, extracted from a larger, in that presented to the Bannatyne and Maitland clubs. With respect, however, to what constitutes the great charm of biography, the interior of the man, his social and domestic habits, there is not a single letter, or even line, bearing on these points, to be found in the repositories of Lord Reay, descended from the General’s eldest sister, of the Hon. Mrs; Fullarton, descended from his eldest daughter, or of his relatives, the Hon. Cornelius, and John Louis Mackay, both Barons of the kingdom of the Netherlands, with all of whom I have been in communication on the subject. This is the more to be lamented, as it makes it impossible to give, in the present sketch, that prominence to the General’s religious character, which formed so essential a part of the man, and will disappoint the pious reader of a view of the Christian experience, and the devout meditations and reflections of this eminent Christian soldier. General Mackay was a man of high station as well as character, who had stood before kings and princes, assisted at their deliberations in council, and commanded their armies in the field, so that even at the present day, the circumstances of his life and death form a part of the history of Europe. It is therefore not a little singular that, of such a man, the only written memorials extant should be confined to a small quarto manuscript volume, comprehending a history of military transactions in Scotland, from the period of his arrival at Edinburgh to assume the chief command, the middle of March 1689, to that of his final departure from Scotland, the end of November 1690; and the history of his Irish campaign of 1691, commencing in May and ending in October of the same year, when he returned for the last time to Holland. The Memoirs may be divided into the three following parts, first, a narrative of military transactions during his command in Scotland, to which are added fragments containing additional facts, and observations on the foregoing; second, a narrative of the Irish campaign of 1691, in which he served under the Baron de Ghinkel; the third consists of letters to the King and the Earl of Portland, from 14th January to 4th November 1690. Both the second and third parts are in French, evidently drawn up with greater care and attention to style; the second especially, as being probably more intended for the public eye. Of these I should have inserted extracts, as specimens of the General’s manner, had I not been dissuaded by a military friend better acquainted with the French language, on account of their numerous inaccuracies, which appear to have proceeded from the transcriber’s imperfect knowledge of the language. The first part is in the first person, after the manner of Caesar’s Commentaries, and is written in a homely and rather antiquated style, such. however, as was in general use among the educated classes of that age in Scotland. The sentences are long, involved, and often obscure, from their length and the little attention paid to punctuation ; all which faults have been multiplied and aggravated by the negligence, or ignorance of those through whose hands they appear to have passed. The whole was written, or transcribed at Bommel in Guelderland, where the General resided with his family; the first part written during the winter of 1690-91, the second during that of 1691-92, and the third at the dates which the letters respectively bear. The reader is requested to take notice, that what has been usually termed “General Mackay’s Memoirs,” is limited to the small quarto volume already mentioned, and that it is now swelled to a larger, by the addition of the selections from his English letters in the edition presented to the clubs. These bear evident marks of having been written in haste, on the spur of the moment; such of them as are addressed to the privy council frequently concluding with a request that their Lordships would be pleased to order copies to be taken, and forwarded to Court, as he had no time to get them transcribed. The Scottish campaign, though in it General Mackay was Commander-in-Chief, while only fourth in command of the Irish, was, of the two, by much the more irksome and trying to his patience. In the former, it is true, he had the sole responsibility, but he was harassed, sometimes by injudicious interferences with his peculiar department, sometimes by a factious op. These faults, when glaring, I have taken the liberty of correcting, by modernizing to a certain degree, the orthography, shortening the sentences, and amending the punctuation, I trust without injury to the character of the composition. position to his measures on the part of his colleagues in the council, and what was still more mortifying, he received not that support from his sovereign, which his character deserved, and the interest of the service required. In Ireland he had no such annoyances to endure. A large army was there assembled, regularly organized, and well disciplined, under general officers of great experience, and knowledge of their profession. 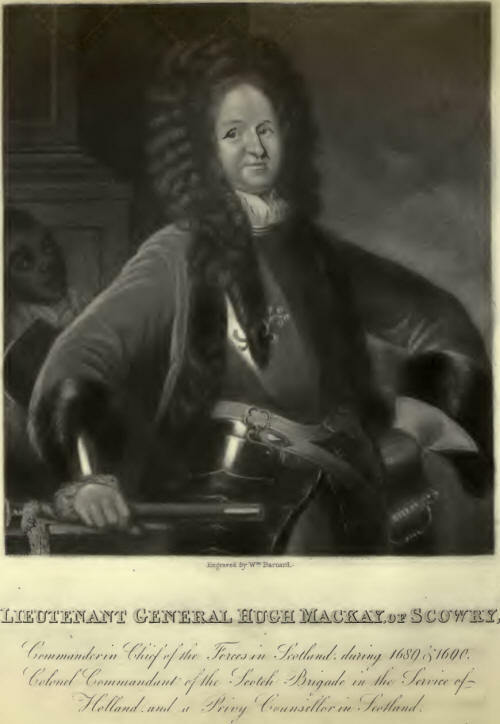 The Commander-in-Chief, the Baron de Ghinkel, though his military talents were not of the first order, yet possessed such urbanity of manners, that the service went on smoothly under him, and though differences occasionally took place among the general officers at their councils of war, in which Mackay sometimes stood alone, that circumstance never interrupted the harmony of their meetings. Responsibility was so divided, that it was only a small part fell to his share, and the specific duties assigned to him he performed in a manner so masterly, that to him, more than to any other individual, was by general consent, ascribed the successful issue of the war. Of the general officers present, four-fifths were foreigners, and these, on returning to their respective countries, spread throughout all Europe the fame of General Mackay’s exploits in the Irish campaign. To this circumstance, together with another co-incident in point of time, that of Marlborough’s falling into disgrace with King William, in consequence of his alleged clandestine correspondence with the court of St. Germains, was probably owing the distinguished honour conferred on Mackay, of commanding the British division of the grand allied army in the following campaign. The circumstances stated in the preceding pages, will, I trust, plead my excuse for thus obtruding myself on the public notice. It cannot be expected, that in the present turmoil of public affairs, this, or indeed any other work of a nameless author, not affecting private interests, or stirring up private passions or fhe prejudices, will excite much public attention. I feel however a secret satisfaction in the consciousness of having collected, as it were, into a focus, from various quarters, scattered rays of information, relating to the life, death, and character of General Mackay, whom I have ever held in the highest veneration, and the contemplation of whose character, I conceive, may be beneficial to private Christians, as well as to men of the profession of arms. In particular, I indulge the hope that it may refute the erroneous notion of Bishop Burnet, respecting the supposed tendency of piety to unfit men for military command; and prove useful to young soldiers and sailors, by shewing them that ardent piety, so far from being incompatible with the character of a hero, gives it a brighter lustre; and by proving to them that no man is so fit for any daring enterprise—a forlorn hope, for instance, mounting a breach, or storming a battery, as he who to the military requisites, adds habitual piety towards God, a firm reliance on his Providence, and in regard to himself, a well grounded assurance that, let death come when it may, it will be to him an immediate entrance to a happier and more glorious state of existence.